It's that time of year again: Thanksgiving, when we all start thinking more about the things we're thankful for. We're grateful for a lot of things, some of them funny and, yes, a little off the wall. When you're going around the table naming things you are grateful for this Thanksgiving, be sure to try out some of our ideas! 1. My broken ereader, because now I have an excuse to get a newer, better one for Christmas. 2. 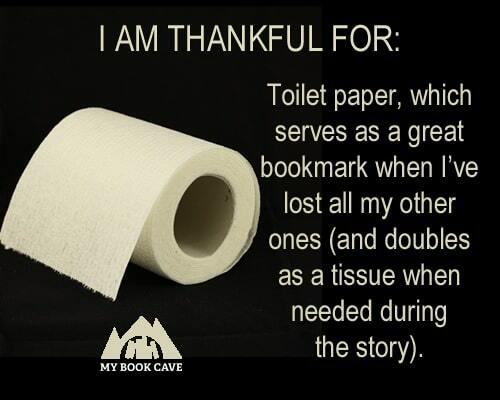 Toilet paper, which serves as a great bookmark when I've lost all my other ones (and doubles as a tissue when needed during the story). 3. My imagination, which makes books so much better than the movies. 4. Holidays, which mean more time to read books! 5. That I dropped the slice of pizza in my lap instead of on my book. 6. My phone, so I can use the backlight to read a book at night. 7. Ink. And paper. For the books, of course. 8. 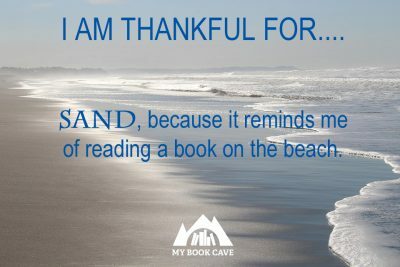 Sand, because it reminds me of reading a book on the beach. 9. A cluttered house, which means more stacks of books to read. 10. Opposable thumbs; seriously, holding a book without them would be incredibly difficult. 11. My children, who give me a great excuse to revisit my favorite children's books. 12. Microwaves, so I can heat up a hot drink or leftovers for dinner and get back to reading right away. 13. Netflix, so my spouse can be entertained while I finish reading that book. 14. Authors' imaginations; there's only so much reality I can cope with. 15. The bathroom, so I can have somewhere to escape when I want to finish just one more chapter. 16. 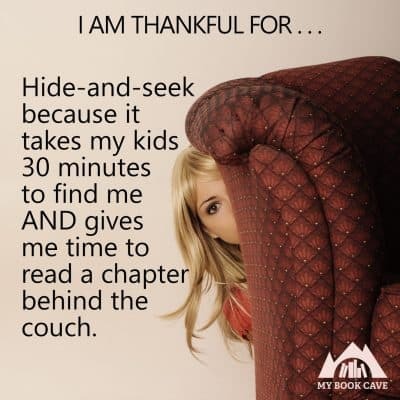 Hide-and-seek because it takes my kids 30 minutes to find me AND gives me time to read a chapter behind the couch. 17. An electric fireplace that is constantly breaking so I can save money on heat bills and exercise my imagination when I curl up to my "warm" fireplace with a book. 18. My husband when he takes the kids on fun nights out so I can secretly read in peace. 19. Books so I can go on adventures I can't afford and experience falling in love with my dream man. 20. Memes about reading, because, seriously, I can't get enough of reading. 21. Two hands—one for chocolate and one to hold my book. What funny things are you thankful for this year?